Cheryl Ash is the owner and head trainer at Hillside Equestrian Center. With over 30 years of experience in the industry and an education at Meredith Manor, Cheryl’s passion with horses has created an environment where students can learn and enjoy their equine friends at the same time. With a high standard of excellence, she promotes good horsemanship in all aspects of equine care and riding. Her USDF Bronze and Silver medals and graduation with distinction from the USDF “L” judging program are proof of her experience and knowledge. As she teaches and judges throughout the area, Cheryl currently is competing her mare “Valkyrie” at FEI level. I have been riding since the age of 7. I have trained horses and competed through 4th level Dressage and preliminary level Eventing. I started learning about Dressage and Competing in events when I was 15. 1981-1983 Assistant Director of Riding at the Univ. of Ma. Amherst , Ma. Coach of the Intercollegiate Riding team, In charge summer riding program. 1983-1984 Managed Kantagree Farm and Riding program in Newtown ,Pa.
1987-1989 Worked for Klaus Travniczek and Susan Carr , Managed farm and trained and horses for Dressage , Eventing , Show Jumping and sales. 2012 to present Teach and Train at Full Moon Farm in Finksburg MD. Phoebe DeVoe is a USEF “r” Dressage Judge, USDF Bronze and Silver Medalist, and Bronze Bar Medalist. In 1999, she built Thornridge Manor, a 40 acre dressage training facility, located in Glen Arm, MD. In 2014, Thornridge Manor expanded to include an additional 50 acres, and two more homes. Thornridge Manor has a very active Adult Amateur and Young Rider lesson program. Both Phoebe and her students have been awarded USDF HOY and USDF All Breeds National Rankings, as well as, regional and local championship awards. Several career highlights include Region 1 North American Young Rider Championships, Top Scoring American Bred Mare for the AHHA Inspection Tour, Grand Champion GAIG/USDF Breeders’ East Coast Series Final at Devon, and 4YO Markel Championships. Phoebe has coached her students to achieve their USDF Bronze and Silver Medals. Although Phoebe works with a wide range of breeds, Thornridge Manor has been recognized by the AHS as an approved Dressage Training Facility, Intro thru FEI, and as an approved Sales Facility. In addition to running Thornridge Manor, Phoebe has maintained various board positions with the Long Green Pony Club, Baltimore County Farm Bureau, Maryland Dressage Association, and the Long Green Land Trust. She has a great passion for land preservation and is currently the President of The Long Green Land Trust. Sarah Duclos is an FEI rider and trainer, and an L judges training program graduate. Her riding accomplishments include earning her USDF Bronze and Silver Medals, as well as several USDF Regional Championships and Reserve Championships at Third Level and above, all on horses she started and trained herself. Her FEI gelding, Astron McEnroe, was Reserve Champion at Prix St. Georges at the US Arabian/Half Arabian National Championships. More recently her mare, Count Down +/ was one of the only non warm-bloods to compete in the open Prix St. George Division at the 2012 GAIG Championships - finishing with a solid 62%! In her younger years, she was an active event rider who competed to the Preliminary level, again, on horses she trained herself. Sarah enjoys helping students with alternative breeds enter and compete in Recognized dressage shows and helping eventers improve their dressage scores. She is also the mother of 8 year old twins and a 10 year old daughter who all ride. 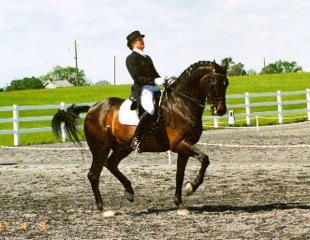 Sarah left a fourteen year teaching career to open Duclos Dressage. Here she puts her many years of teaching experience, both in and out of the classroom, to use helping all level of riders become more confident students of dressage. Evelyn Pfoutz is a freelance dressage trainer, DBA Cool Breeze Dressage. She is a graduate of Lake Erie College where she earned her Bachelor of Science degree in Equestrian Studies: teacher/trainer emphasis. She is a USDF Gold, Silver and Bronze medalist, as well as earning the USDF Gold, Silver and Bronze Musical Freestyle Bars. She is a USDF L graduate as well as a graduate of Level 1 Positive Riding Program. She specializes in making award winning musical freestyles at all levels. She is a 10 time BLM Champion with 8 of those being MFS titles. She has mostly trained with Charles deKunffy, Henrick Johansen, Sharon Schneidman and Fred Weber. Angi Voss is an “L Grad with Distinction” and is currently enrolled in the “r” judging program. She has obtained her USDF Bronze Medal and is currently working towards FEI scores for her USDF Silver Medal. She has been lucky to study and train with many classical trainers including Tom Poulin, Sharon & Grant Schneidman, Kathy Connelly, & Betsy and Jessie Steiner .